(CNN) -- Iranian presidential challenger Mir Hossein Moussavi's hometown of Tabriz is Exhibit A for his supporters as they argue that last week's election was rigged. 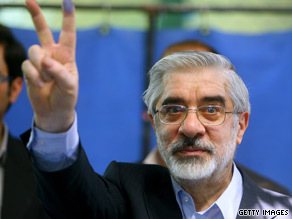 Mir Hossein Moussavi lost last week's Iranian presidential election, according to official numbers. Official results from Friday's polls show that the city and its surrounding province of East Azerbaijan -- dominated by ethnic Azeris like Moussavi -- voted 57 percent to 42 percent to re-elect hard-line incumbent President Mahmoud Ahmadinejad. It's a result many observers of Iranian politics find incongruous, but just one of the things that have raised eyebrows among Western analysts. An Iranian official who asked to remain unidentified said Monday that Moussavi was not popular in Tabriz. There were no exit polls conducted in Friday's balloting and little polling before the election. Nate Silver, who runs the U.S. election Web site FiveThirtyEight, told CNN the official results were "ambiguous." "The fact that you had some areas where conservatives got only 20 percent of the vote in 2005 and got 70 percent of the vote this time -- things like that have people who already had doubts about those numbers scratching their heads," Silver said. Q&A: Was the Iranian election rigged? "I don't think it gives them clean hands, but I don't think there's any smoking gun, either," he said. And Ken Ballen, the head of a Washington think tank that polled Iranians three weeks before the vote, said it was premature to declare the Iranian vote fraudulent. Ballen said his organization, Terror Free Tomorrow, surveyed 1,001 Iranians in mid-May. That poll found Ahmadinejad leading the four-candidate field with 34 percent support, while Moussavi trailed with 14 percent. The remaining two candidates, former parliament speaker Mehdi Karrubi and onetime Revolutionary Guards commander Mohsen Rezaie, drew 2 percent and 1 percent. "That does not mean that he would have won the election, and we never said he would," Ballen told CNN's "Newsroom" on Tuesday. "Many people think there was a late surge for Moussavi, and our poll does not reflect that." But he said the poll suggested that Ahmadinejad would have had a "very large" share of the vote "and possibly enough votes for him to win." The survey had a sampling error of plus or minus 3.1 percentage points. Silver said the Terror Free Tomorrow poll was conducted "about as well as a poll can be done in Iran." But he said the number of people who expressed no preference -- 27 percent -- suggests that "a lot of people are scared to admit their true preferences." Meanwhile, the provincial totals showed "big shifts" toward Ahmadinejad compared with 2005, when he came in second in the first round of voting and won office in a runoff, Silver said. Daniel Berman, a graduate student in Iranian studies at St. Andrews University in Scotland, called some of the reported results "genuinely weird." He said the official results show that Ahmadinejad more than doubled the 2005 showing for all conservative candidates in the western provinces of Luristan and Khuzestan, two majority-Arab districts that have heavily favored reformist candidates in previous races. According to those results, Ahmadinejad won 71 percent of the vote in Luristan, which is Karrubi's home turf. Karrubi was the leading reformist candidate in 2005 but drew 5 percent in his home province Friday, according to the official results. Although Karrubi won 17 percent of the nationwide vote in the first round of the 2005 elections, he racked up less than 1 percent in the official tally Friday, Berman said. Meanwhile, the reported turnout of over 80 percent should favor one candidate over another. But "there's no correlation between turnout and candidate performance anywhere," he said. And in the northern province of Mazandarin, Berman said, authorities reported that the number of votes cast exceeded the number of eligible voters on the rolls by about 4,500. Berman said he's not only convinced that fraud occurred, "I also think it's very sloppy, and I also think it's very last-minute." Ahmadinejad took about 63 percent of the vote in the 2005 runoff, similar to his reported share Friday. But in the first round of voting that year, he captured only 20 percent in a field of seven. Meanwhile, Karroubi -- the leading reformist candidate in 2005 -- saw his support plunge from the 15 percent he won that year to less than 1 percent on Friday, according to the Interior Ministry results. In addition, Karroubi managed only 5 percent of the vote in his home province of Luristan in western Iran on Friday, down from more than 50 percent in 2005, while Ahmadinejad won more than 70 percent. Meanwhile, Ahmadinejad had a stronger showing in the cities than in 2005. "The relationship between how the vote was distributed geographically in 2005 and in 2009 was relatively weak -- weaker than one might expect and certainly weaker compared to American standards, where you have the same swing states more or less every year," Silver said. Moussavi has asked Iran's Guardian Council, which is made up of top clerics and judges, to throw out Friday's results and hold fresh elections. The council has said only that it would investigate and agreed Tuesday to recount some votes. But in the end, Molavi told CNN's Campbell Brown, what observers think doesn't matter: "It matters what the Iranian people think." "You have something like hundreds of thousands of Iranians, not only in Tehran but across the country, who do feel this was a stolen election," he said.